Q. Out of treated, cedar and composite. Which has the least maintenance? A. Nothing outdoors is no maintenance, but PVC decking has the least maintenance. PVC decks do not need to be sealed only cleaned. Wood decks need to be maintained every 2-3 years. Q. How much more expensive is composite than cedar? A. Due to the fact that composite is a low maintenance product, the materials will be approximately 50% higher. Labor will be based upon the design of your deck. A PVC deck will typically run 3x more than a pressure-treated deck. Q. Is there any advantages to using cedar over composites? A. The only advantage to using cedar over composites is that economically, cedar is less expensive in the short term and it has the natural wood beauty that you can’t get from any other material. However, the cost of maintenance over a 7 – 10 year period will add up to the cost of composites. More work for the same amount of money. Q. Does your company offer a workmanship warranty on the decks that you build? A. Yes. We offer a 1 year labor warranty on all decks. Q. Do composite manufactures guarantee their product. A. Yes! Most offer a 25 year limited warranty transferable when you sell your home to a new owner. Trex stands behind their PVC product. Q. Who will be building my deck? A. We build the decks we sell. The employees of Supreme Deck will be building your deck. Q. Are you licensed and do you build to code? A. Yes, We are licensed under Craig Niner. All new decks that are built are built to city codes. We tape the permits to your back door wall, which is where the inspector put the stickers. What is the difference between natural wood, composites and plastics? Economically, cedar is less expensive in the short term and it has the natural wood beauty that you can’t get from any other material. However, the cost of maintenance over a 7 – 10 year period will add up to the cost of composites. More work for the same amount of money. What is composite decking and what are the benefits to using it? What is plastic lumber and what does it do? There are a wide variety of different types of plastic lumber available. Some use recycled plastics and some use virgin polypropylene. The base product is made of recycled plastic: 100% recycled High-Density Polyethylene (HDPE). HDPE is used to make anything from shampoo and detergent bottles, to milk jugs. Some plastic lumber is made entirely of HDPE, which comes in a variety of molded-in colors. Other types of plastic lumber use composites, which consist of a mixture of recycled HDPE with wood fibers, rubber, fiberglass, or other plastics. Depending on the brand and the application, plastic lumber composites are available for those needing a stronger material, or for those wanting a long-lasting alternative to wood, but with the paintability of traditional hardwood lumber. Why use plastic lumber for a deck? Plastic lumber has several advantages over traditional hardwood. It eliminates the need for expensive and time-consuming repainting and sealing. Plastic lumber will not rot, crack, warp, or splinter and it does not offer an attractive place for the insect population to call home. In fact, plastic lumber is denser than wood, practically maintenance free, long lasting (up to 50 years depending on the application), stain resistant, waterproof, impervious to insects. Environmental Benefits of using Composite or Plastic Decking. Made of recycled plastic and wood, they are a high quality product that is both an environmentally friendly and economically viable alternative to traditional hardwood lumber, which is often times injected with chemicals to ward off impending insect attacks. 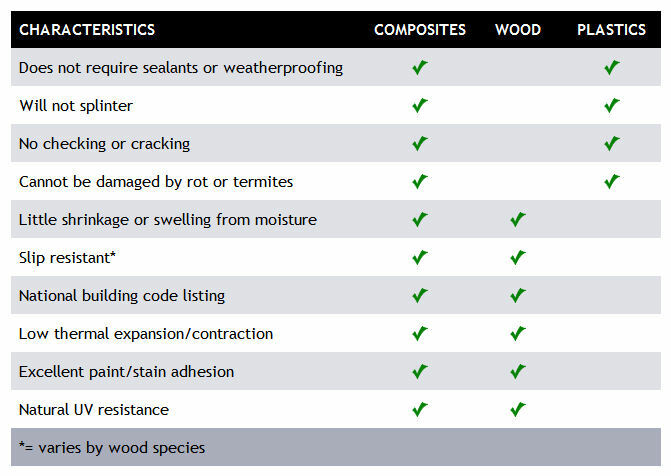 composite lumber, on the other hand, contains no hazardous chemicals and cannot leak or contaminate the soil. Additionally, serious worries about deforestation and the role trees play in helping prevent global warming, are issues of concern for both the consumer and the building industry. Therefore, using composite lumber rather than hardwood has remarkable practical advantages as well as these significant environmental advantages. Composite and PVC decks are the latest” low maintenance” deck trend. We feel wood decks in Michigan are still the time tested best value for deck. Many people that have had an unlicensed contractor install a composite deck will tell you that they have issues with mold, hidden fasteners, miters, or warping of their composite deck. 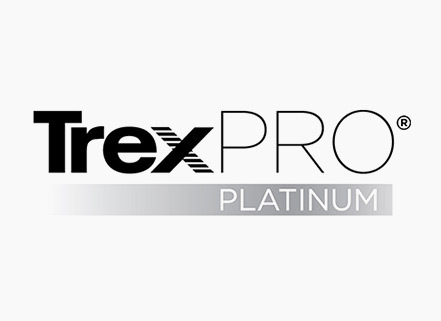 To get the 25 year Trex warranty you need to hire a certified TrexPro installer. Do your research before installing a composite deck and make sure you hire a Trex certified contractor. Supreme Deck is one of Michigan’s largest installer of Trex decks and certified as a TrexPro Platinum installer. Understand that there are many materials to choose from and each material must be installed to the manufactures specifications or you will have problems with the products. The gaping, joist spacing and type of fasteners used on a composite deck need to be to manufactures specifications or you may encounter problems. If installed right, Trex decks with a pvc wrap such as Transcends and Select hold up the best to Michigan weather. Certain composite materials will require cleaning a couple of times a year to make it look good again. (Good—not, “Like New”). Our Deck Cleaning division services hundreds of composite Trex decks each year. If you install a composite, Trex, or PVC deck just remember you will still have to clean it. Ipe or Mahogany will likely have a durability of 40 years if sealed or oiled yearly. A wood deck can be refinished every few years to look like new again and be able to replace rotted boards to match. You can’t refinish a composite deck—you simply replace it. Composite and PVC decks typically run 2-3x for materials more than a wood deck. The maintenance costs are built into the price, so you pay the maintenance up front. By deciding to go with a synthetic deck we feel that Azek, Trex Escapes, Choicedek, or other PVC decks are the best choice. If you invest the money in a composite deck, it is best to go with Timbertech, Trex Transcends, Fiberon decking, or similar PVC type of decking material in Southeast Michigan. Supreme Deck is a certified Trex and Fiberon decking contractor for Michigan.